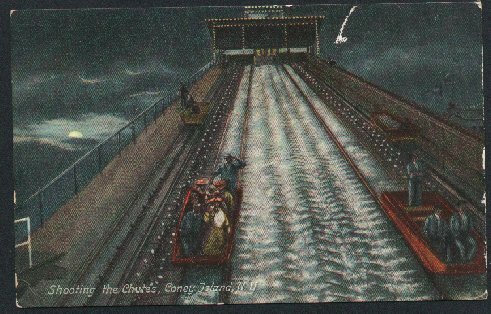 "Shooting the Chutes - Coney Island, NY - Circa 1908"
(807) POSTCARD:Shooting the Chutes - Coney Island, NY.-Condition: Good +. Circa 1908 - Colored Illustration. Shows an audience experiencing the thrills of riding the Chutes in all their Victorian Finest. It was done to represent a night picture with the moon in the background and the chute itself illuminated. Rest of picture is darker than on scan. Not Posted. Price: $4.00 + shipping.